So today I wanna tell you a bit about keratoplasty or also called corneal transplant. 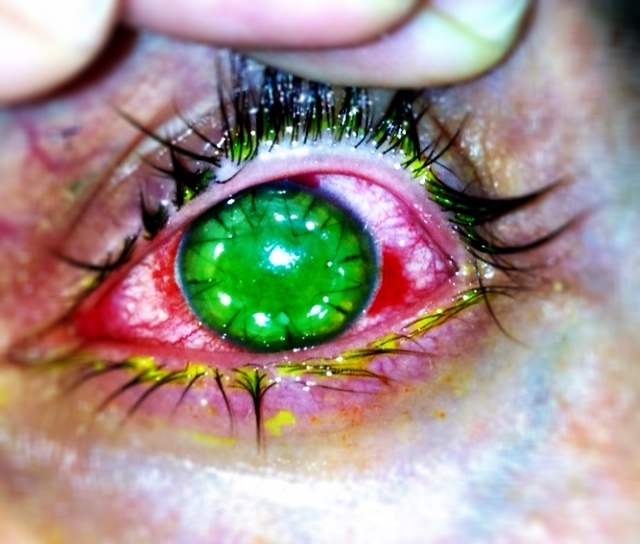 2 years ago I got a severe infection on my left eye - an extremely destructive bacteria called pseudomonas aeruginosa contaminated my contact lens. This bacteria is to be found in water infrastructures like toilets, probably got it from a youth hotel when i travelled scottland. 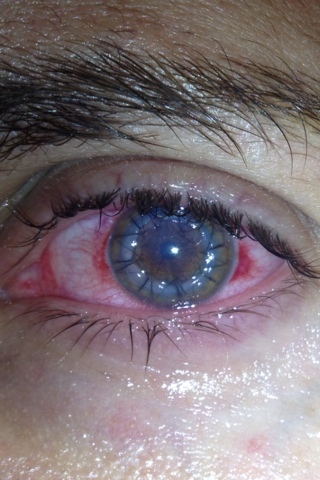 After contamination I wore the contact lens overnight - which all made very very worse. In addition the bacteria probably also contaminated the container of the contacts, and laboratory tests found the bacteria in both contacts. So I'm quite happy that I only got infected in one of the eyes. Back from my Scottland trip I visited a local eye specialist and he gave me some tear drops. At that time we had no idea that behind all of this could be this evil pseudomonas. After 2 days my eye developed a "corneal ulcer", like a big hole in my cornea that blocked my vision in the center. The eye specialist wasn't expecting this worse result after the eye drops - and he directly lead me to the hositpal / eye clinic as an emergency. In the hositptal I immediately got hospitalized for 2 weeks - a long time, just lying and sitting there in a bed, waiting for the nurses dropping anti-bacterial stuff in my left eye. In the first days this had to be done in a very tight timeplan , approx. every hour a new type of drop. You could lose sight completely if you don't fight against those pseudomonas - it's very agressive. After 2 weeks of hospital I could return home and continued there giving me these drops all day long, always observered by a doctor where I had to go 2 times a week. Then finally after about a month I won the battle against the attacking organism - the ulcer was gone and my cornea began healing and the hole from the bacteria was closed. Then it took about 1.5 years to get a final result of the scarring. The scar was directly on top of the pupil and so completely blocked my eye focus in the center. My vision was about max 10%. The brain adapted to this new situation and put its processing power on the healthy right eye - daily work and life was going on. Actually i could have accepted the situtation but then I got the info on possible solution: a corneal transplant or keratoplasty. So what happens in this organ transplant? 1. You need a donor cornea: I can't thank the person enough who donored me his cornea, ill never know who it was, but his cornea will bring me back to near normal sight. So everyone: make sure you do a donor passport - a cornea you wont need anymore after death, but for somebody else its a wish come true. In the states there are over 40'000 corneal transplants per year - unbelievable. Reasons are very different: scarring, toxic Injuries, fire or burn and of course physical damage from various things. 2. get an expert doctor who is experienced enough! Here in Switzerland there are about 500 transplants a year, most of them done in the hospital of Lucerne. Since there is a cornea donor bank. 3. The surgery itself has different manners of executions. I had to go with the 'penetrating keratoplasty' where the complete cornea of my eye got replaced with the donor's. This kind of transplant was firstly executed over 100 years ago and its by far the most routine transplant surgery today. With an exacto like knife kit ( the trepan ) both corneas get sliced to the correct part , then the donor one gets placed into the eye (like a little cylinder) and after that the eye surgeon will stitch it with the rest of my orginal cornea around it. The whole surgery is under General anaesthetic. It sounds crazy and the result looks definately wild. But I didn't feel any pain until now. 4. After the surgery you go into longterm eyedrop and status checking therapy. With lots of cortisone and other stuff that you have to put into the eye. This makes it more safe that there will be no rejection of the transplanted cornea. A donor transplant should stay completely translucent otherwise you have to repeat and do re-keratoplasty. In a cornea transplant the risk of rejection is very small because there are no blood vessels in this part of the eye. So ever single one of you could become a donor one day. 5. After about a year the sutures will be removed - thats when you will see the best result and hopefully reestablished and normal sight. I hope for vision of 70 - 80% and get the rest corrected with lenses, laser or the glasses. I can leave hospital on my fith day after surgery. So there's a lot of work and time ahead of me. This massive transplant will hopefully heal in time. Little Update - a vid with my macro lens of the stitches in the eye. Just incredible! Bro...take good care of yourself!